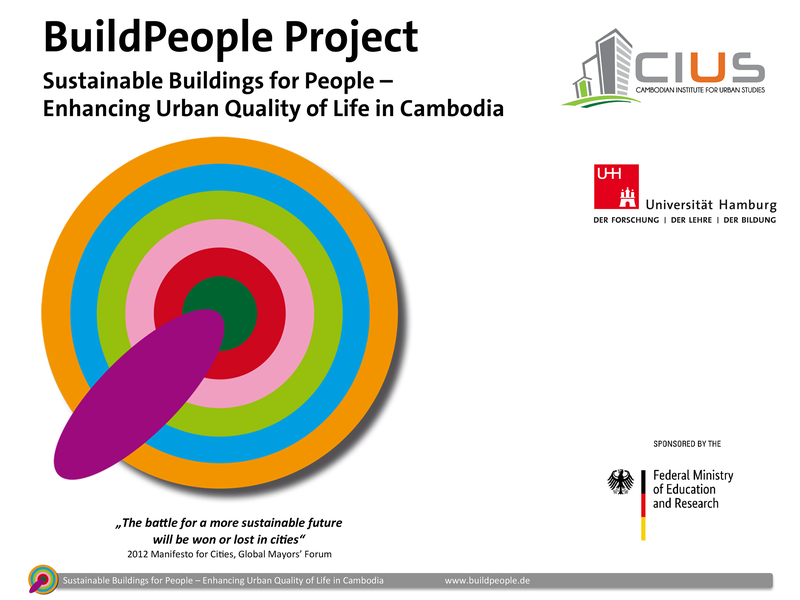 02/2018: Stakeholder Workshop at Paññāsāstra University of Cambodia, in the context of the BMBF-funded BuildPeople-Project: Sustainable Buildings for People – Enhancing Urban Quality of Life in Cambodia. 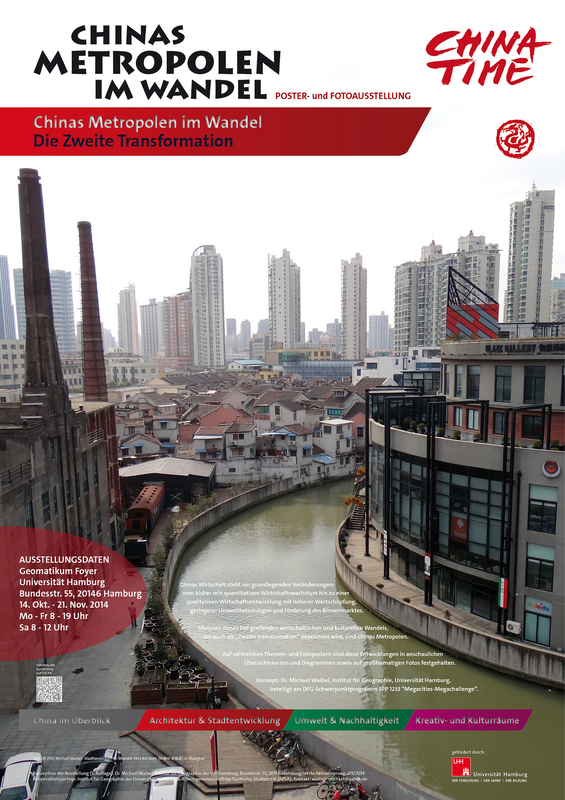 03/2016-03/2017: Development of the photo book “Phnom Penh: Capital City” – Presentation and exhibition opening at META House, Phnom Penh, 16 March 2017. 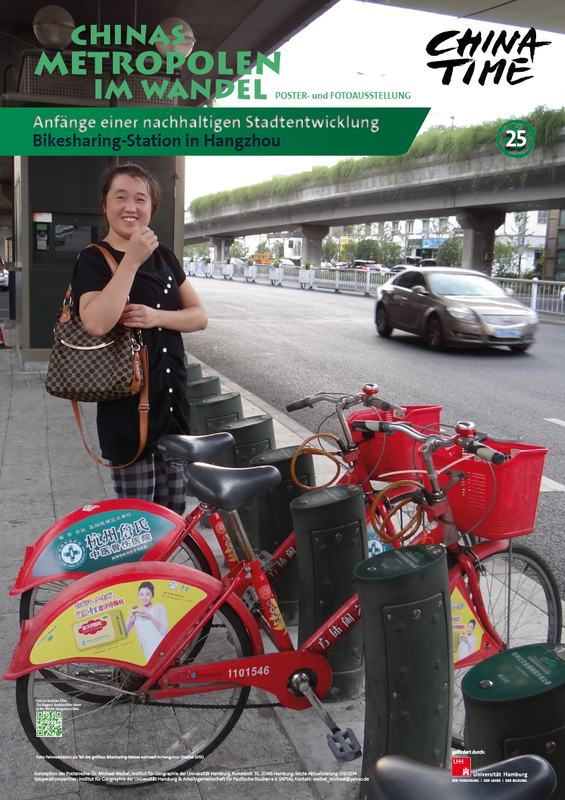 03/2015-03/2016: Development of the photo book “Đà Nẵng: COASTAL City” – Presentation at Municipal Library of Da Nang, 17 March 2016. 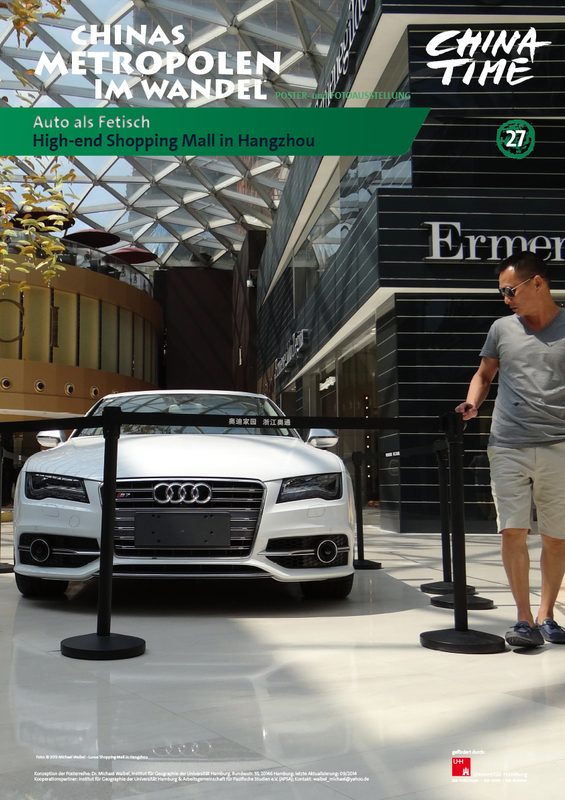 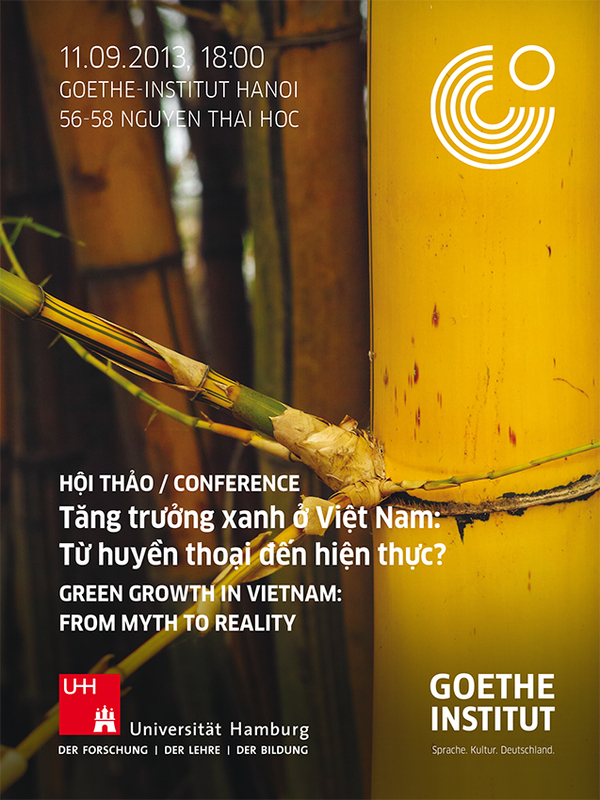 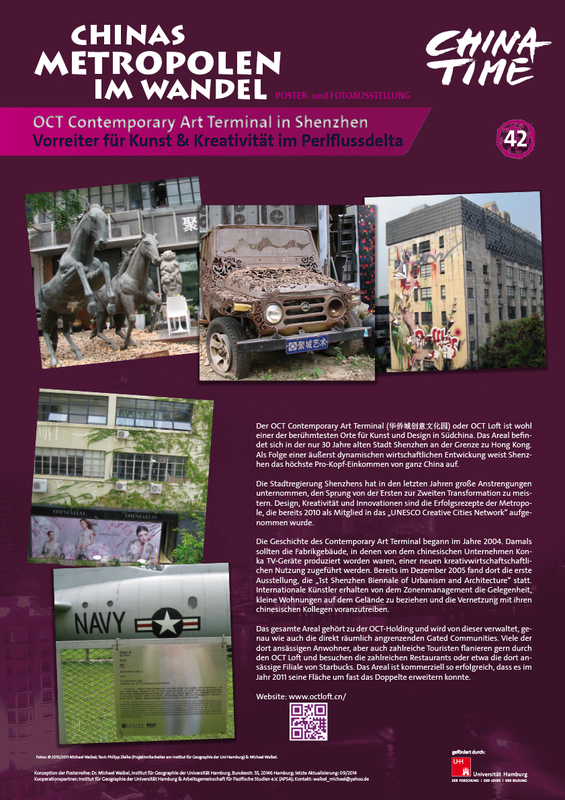 04/2014-12/2014: Conceptualization, scientific organisation and keynote speech in the context of the international conference “Creativity and the City: Challenges and Chances for Vietnam”, on behalf of the Goethe-Institut Hanoi, 30 September-02 October 2014, Hanoi. 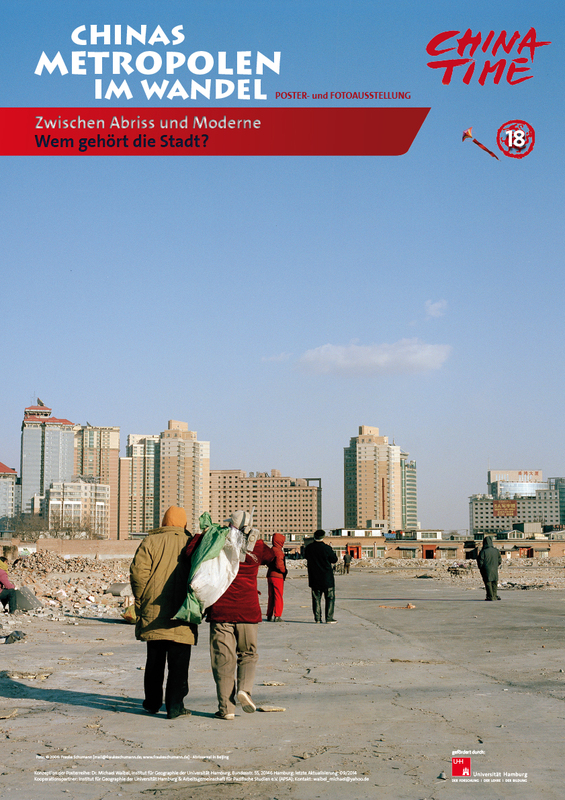 Conference Proceedings (English Edition): Waibel, M. & A. Meyer-Zollitsch (eds.) 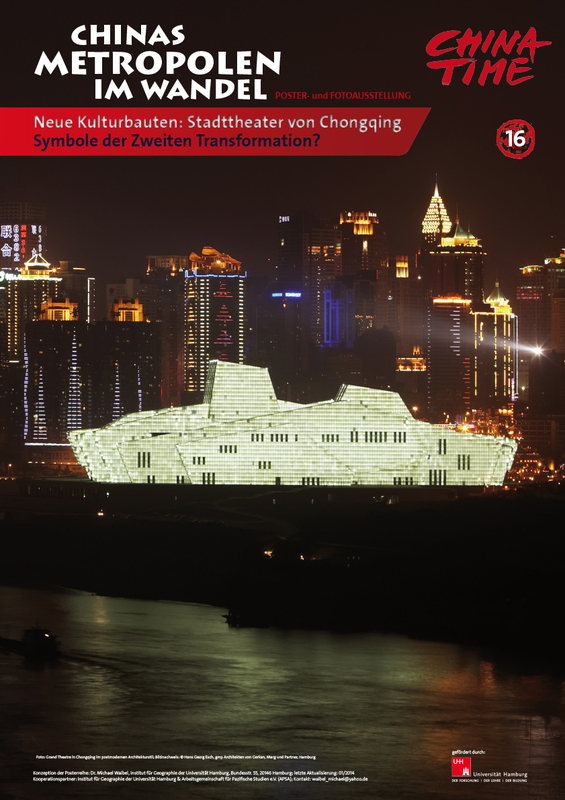 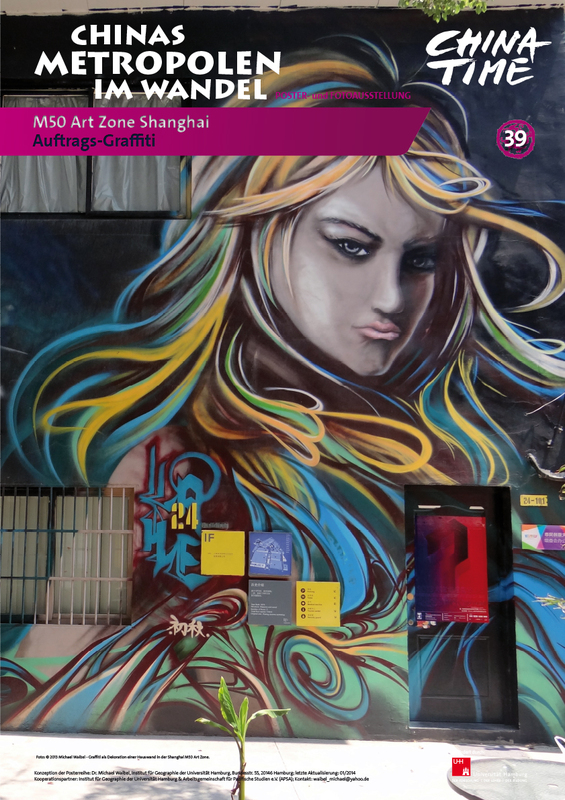 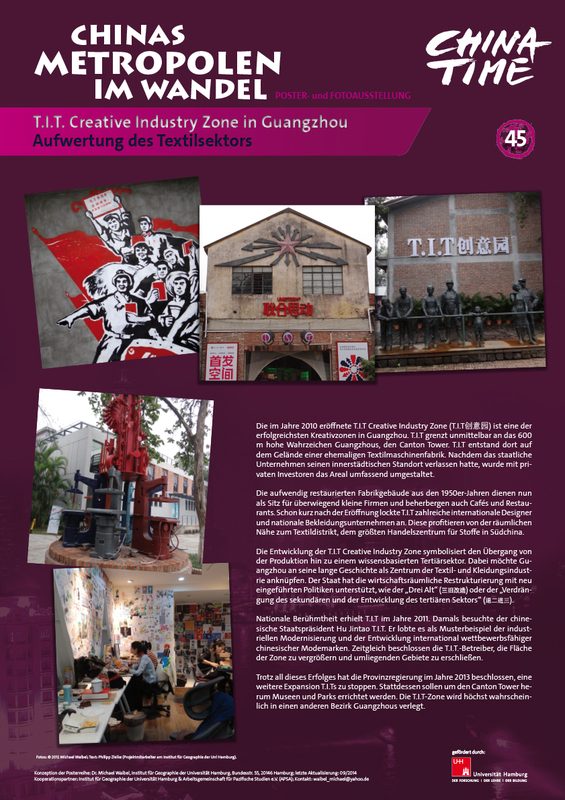 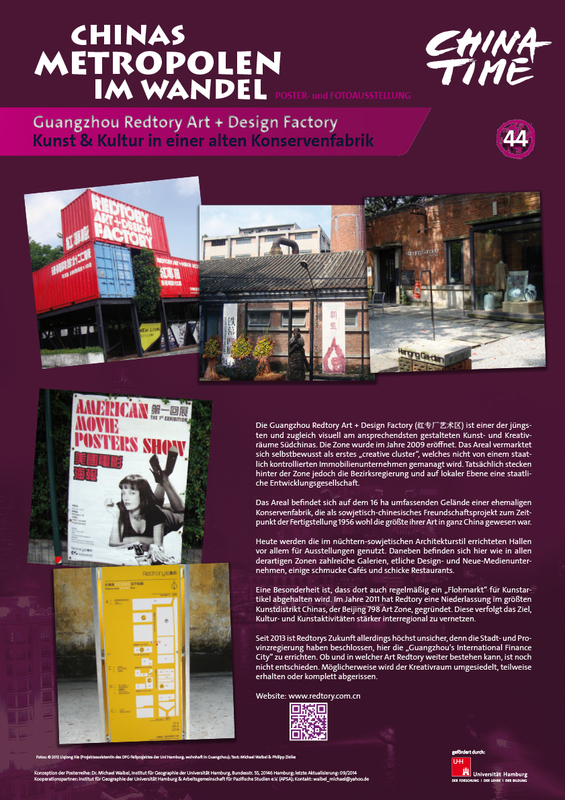 (2015): Creativity and the City: Opportunities and Challenges for Vietnam. 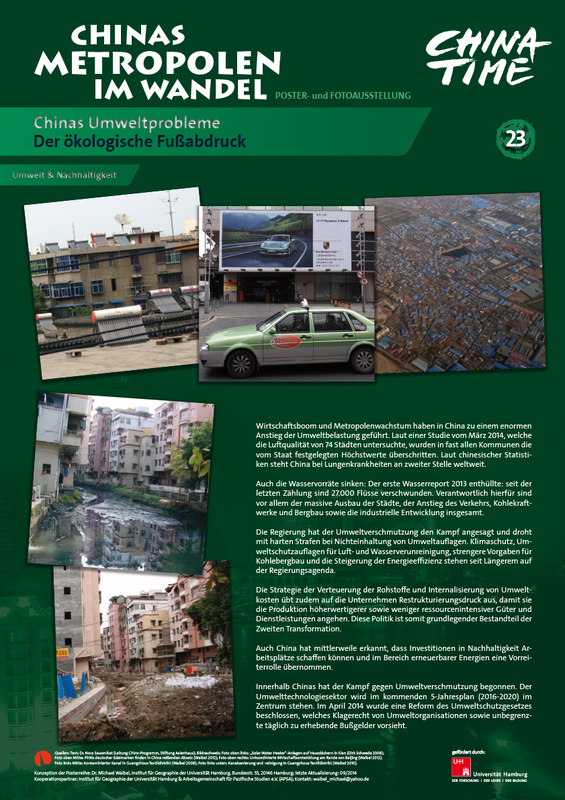 Hanoi, Vietnam, 82 pages. Conference Proceedings (Vietnamese Edition): Waibel, M. & A. Meyer-Zollitsch (biên tập) (2015): Sáng tạo và phát triển đô thị: Cơ hội và thách thức đối với Việt Nam. 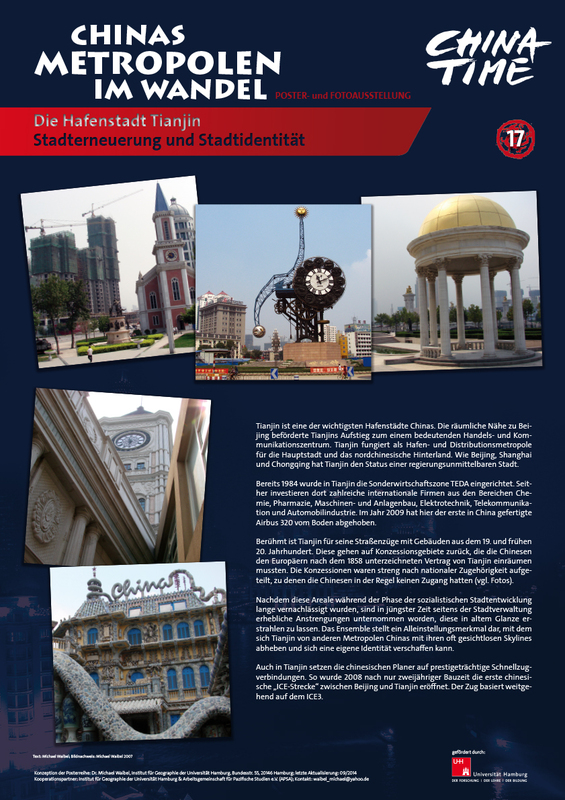 Kỷ Yếu Hội Thảo, Số Xuất Bản Tiếng Việt. Hà Nội, Việt Nam, 82 trang. 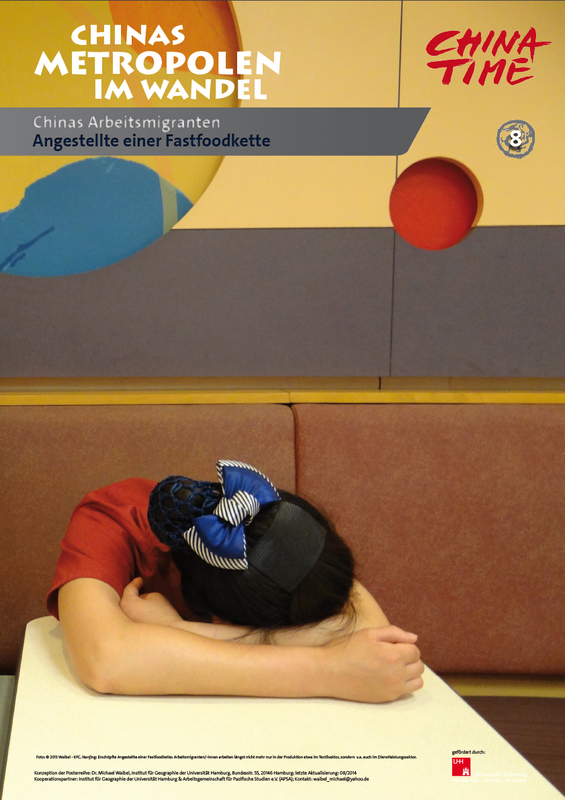 ISBN: 978-604-78-4046-5. 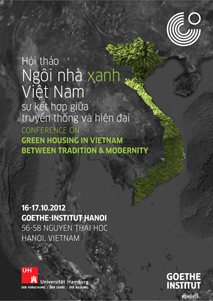 09/2013: Chair of a session about “Sustainable Urban Development: Green Cities & Green Buildings” at GreenBiz 2013 – European Green Business Solutions for Vietnam, Melia Hotel, Hanoi, 19 September 2013. 09/2013: Conceptualization, scientific organisation and keynote speech in the context of the conference “Green Growth in Vietnam: From Myth to Reality“, on behalf of the Goethe-Institut Hanoi, 11 September 2013, Hanoi. 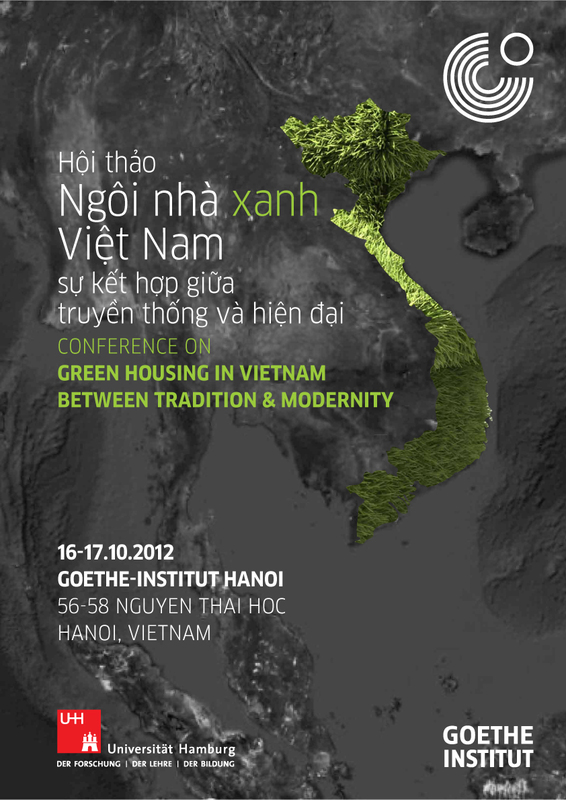 04/2012-12/2012: Conceptualization, scientific organisation and keynote speech in the context of the international conference “Green Housing in Vietnam between Tradition and Modernity”, on behalf of the Goethe-Institut Hanoi, 16-17 October 2012, Hanoi. 10/2011: Conceptualiziation of the Poster Exhibition “MegaCities in Southeast Asia”, on behalf of the Asia House Essen, Southeast Asia Information Desk. 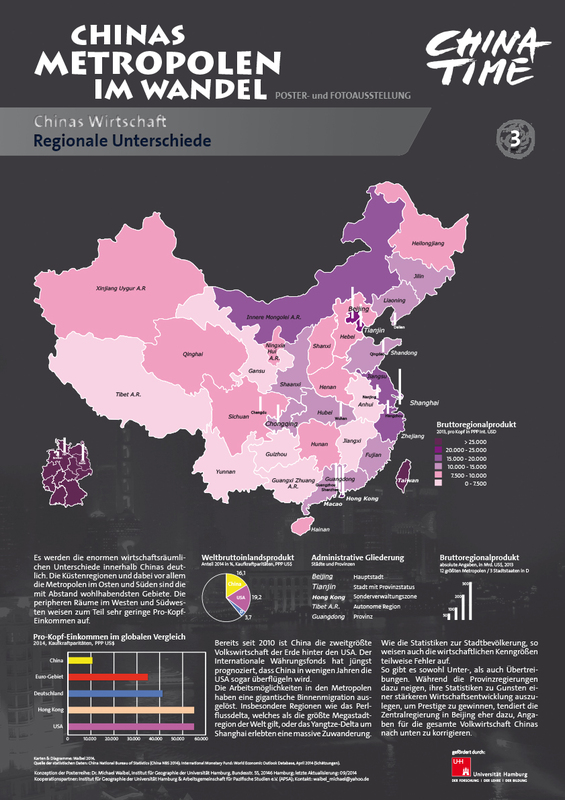 04/2011: Chair of a Session on “China Reloaded: Urban Governance in Times of Economic Restructuring and Rapid Urbanization” (Session ID 5259). 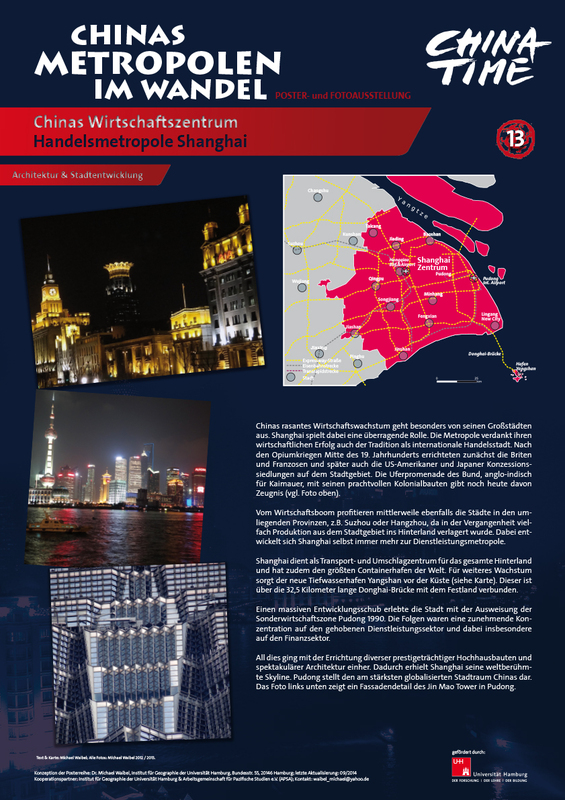 Sponsorship by China Geography Specialty Group. 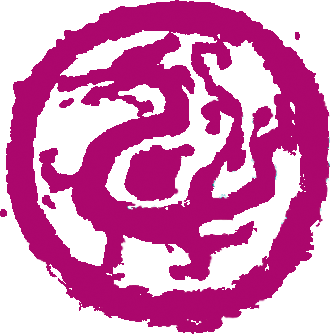 Annual Meeting of the Association of American Geographers (AAG-Meeting). 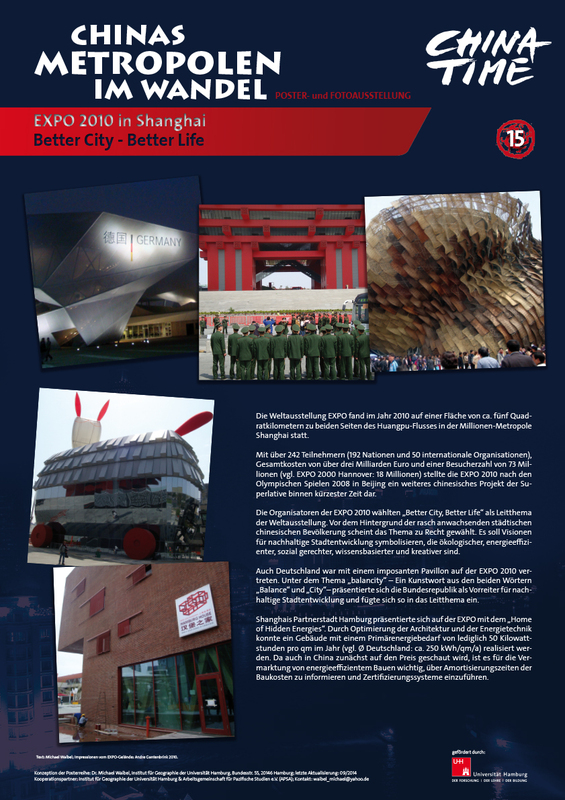 12-16 April 2011, Seattle/U.S. 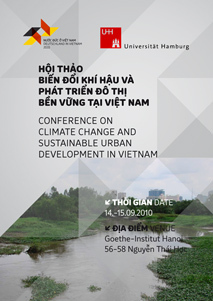 04/2010-12/2010: Conceptualization, scientific organisation and keynote speech in the context of the international conference “Climate Change and Challenges for Sustainable Urban Development in Vietnam”, on behalf of the Goethe-Institut Hanoi, 14-15 September 2010, Hanoi. 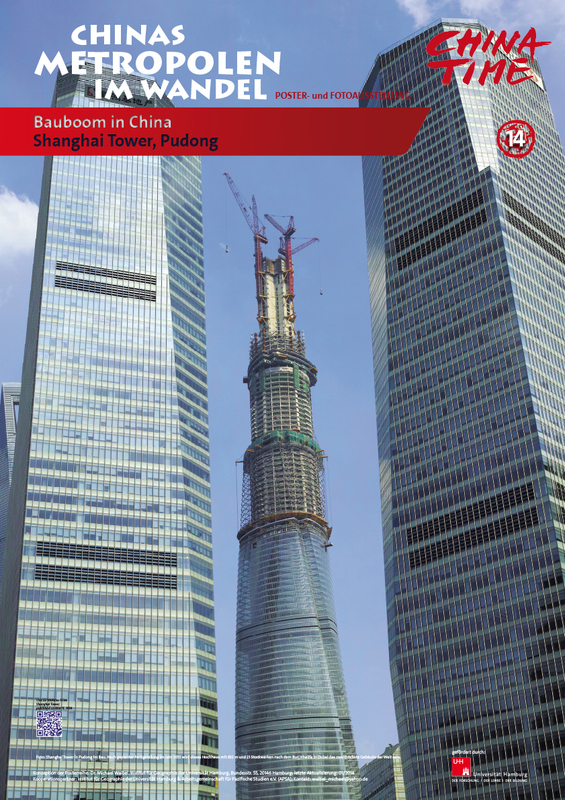 04/2010: Chair of a Session on “Urban Governance in China – Towards an Application of Western Concepts?”. 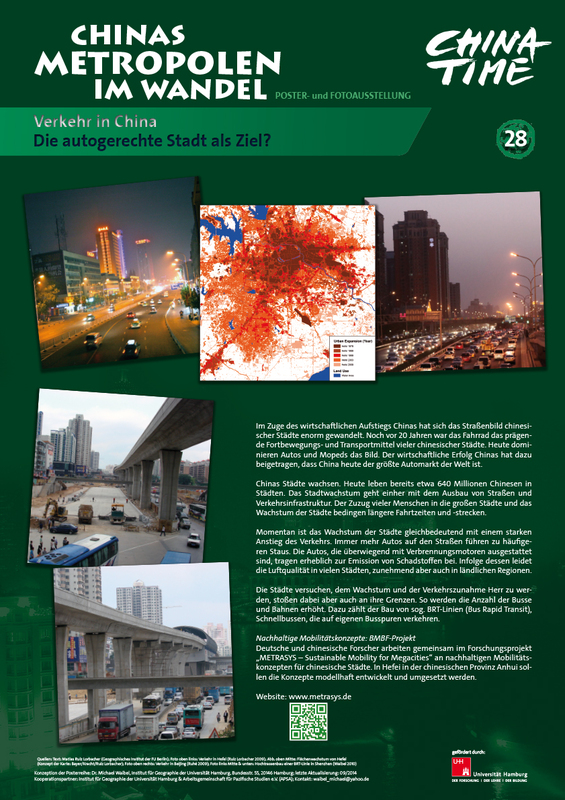 Annual Meeting of the Association of American Geographers (AAG-Meeting). 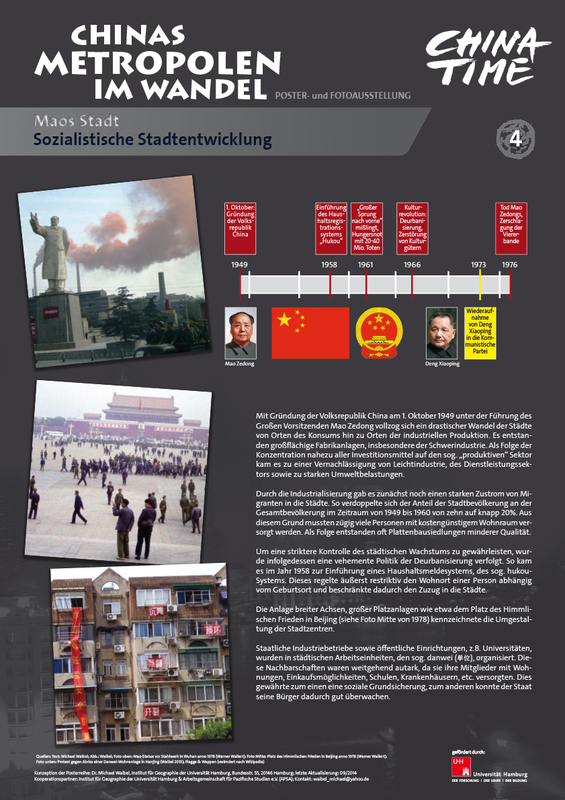 14-16 April 2010, Washington D.C./U.S. 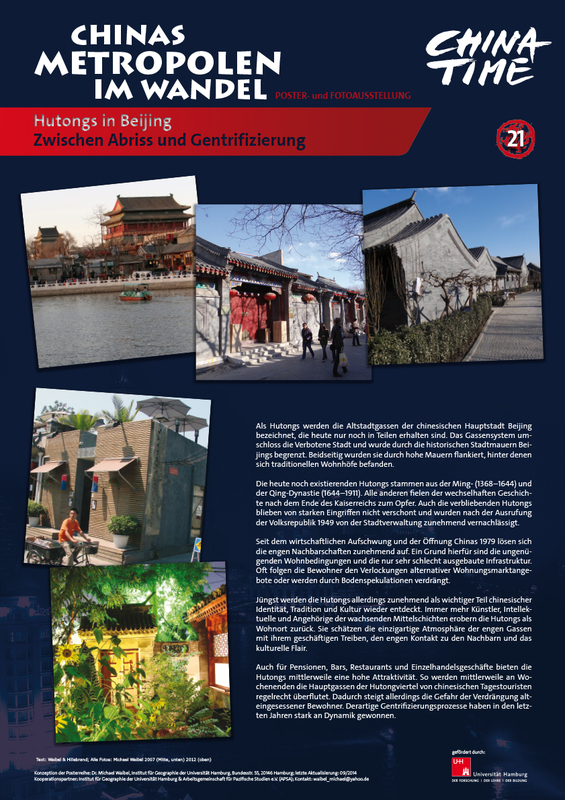 06/2009: Conception and scientific organisation of the international workshop “Urban Development in a Globalising World – Overcoming the Formal-Informal Divide” (together with Colin McFarlane, Dep. 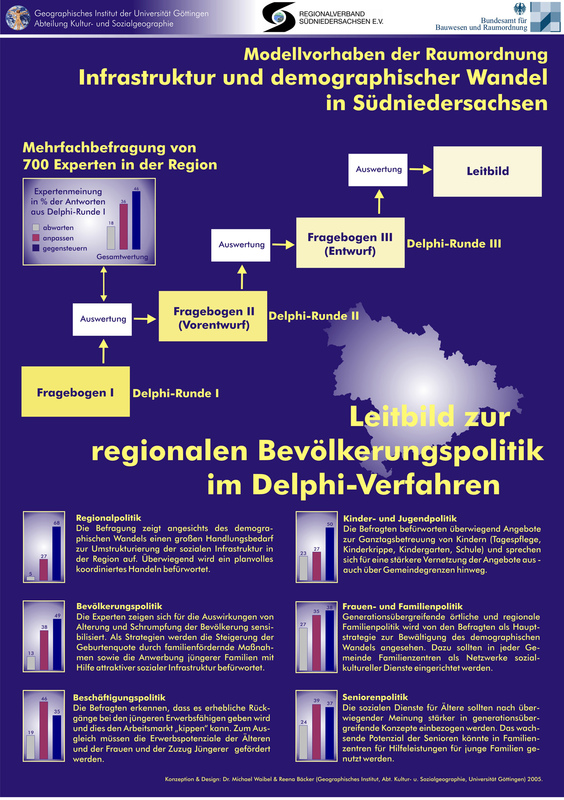 of Geography, University of Durham), on behalf of the Irmgard-Coninx-Foundation in cooperation with the Humboldt-University and the WZB, 12-13 June 2009, Berlin. 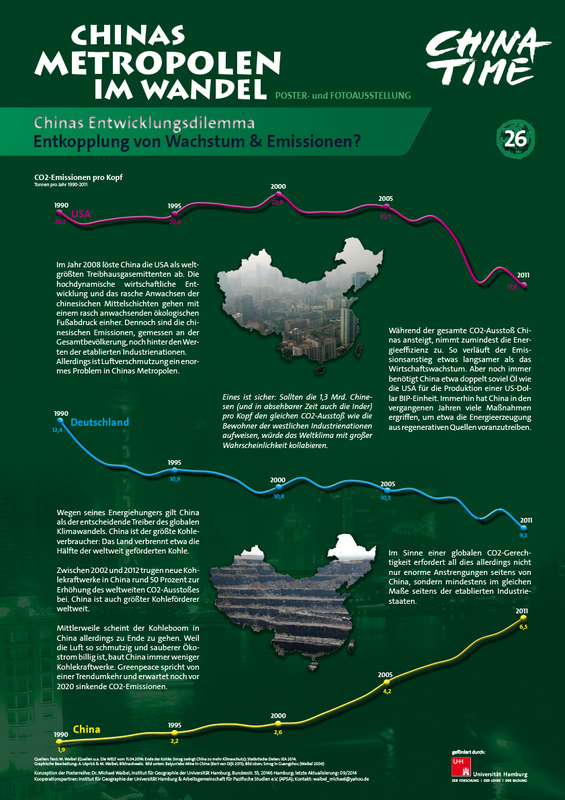 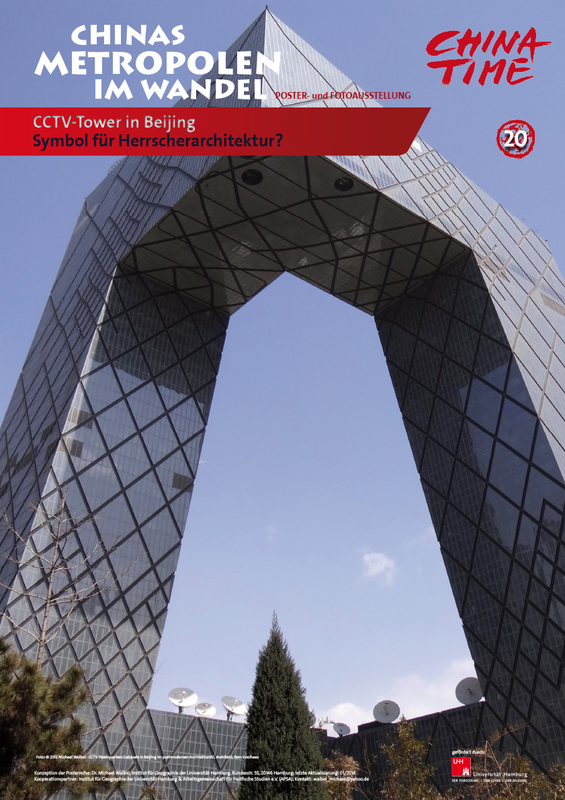 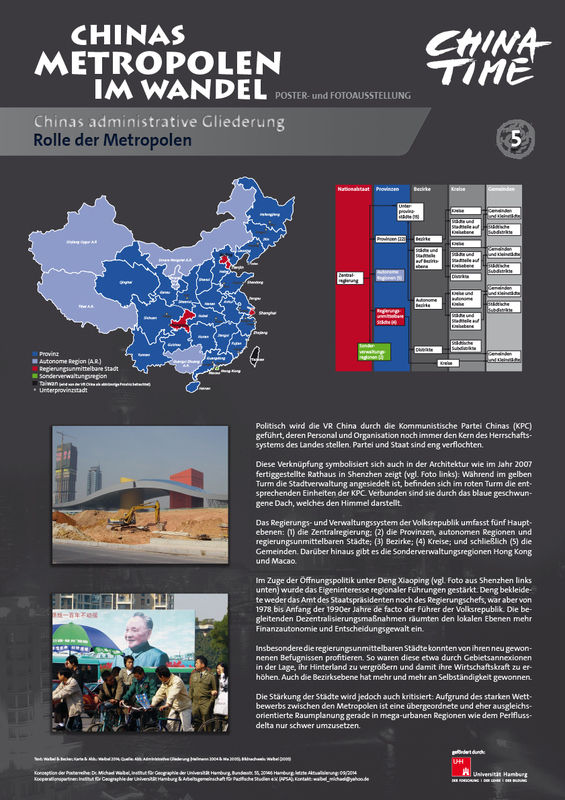 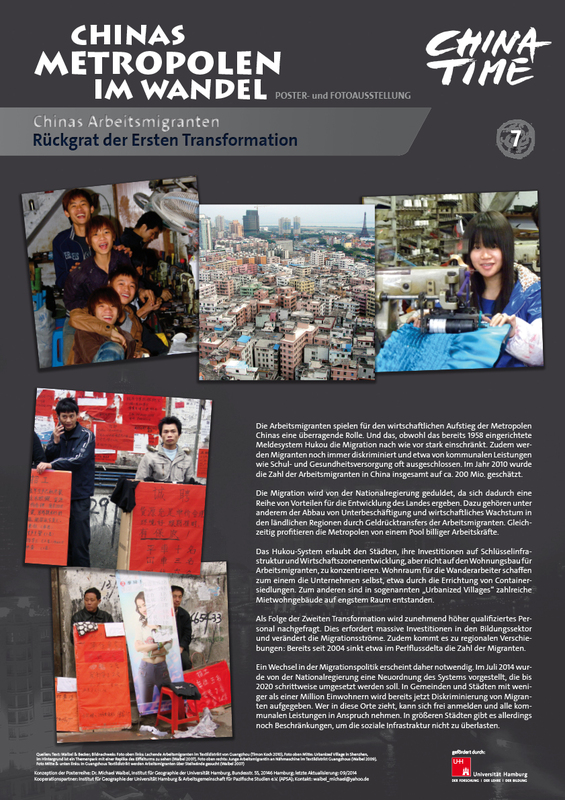 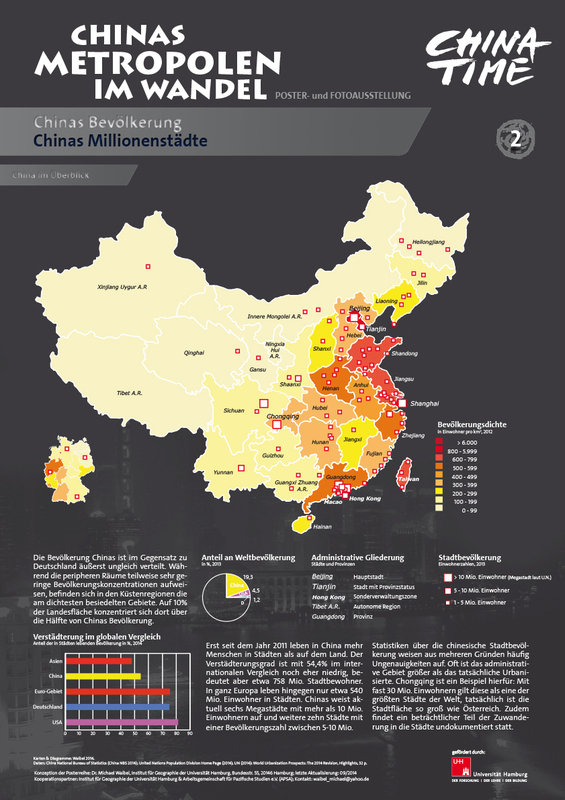 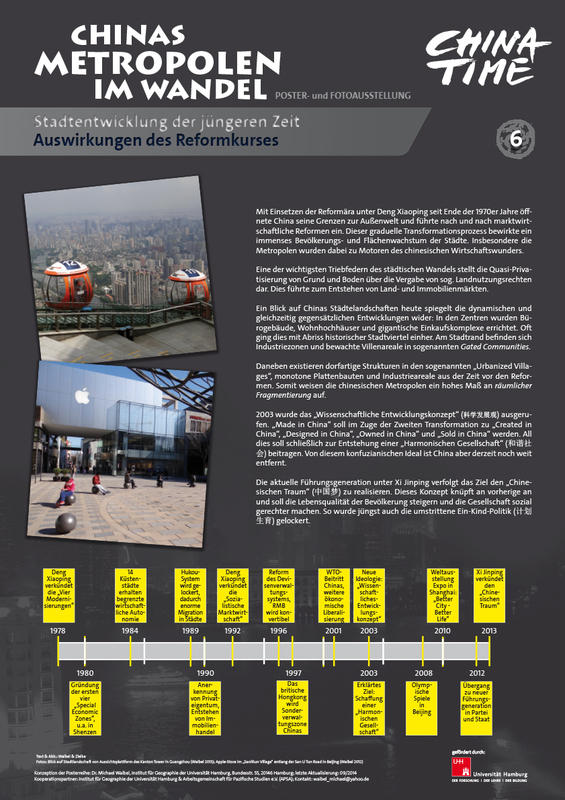 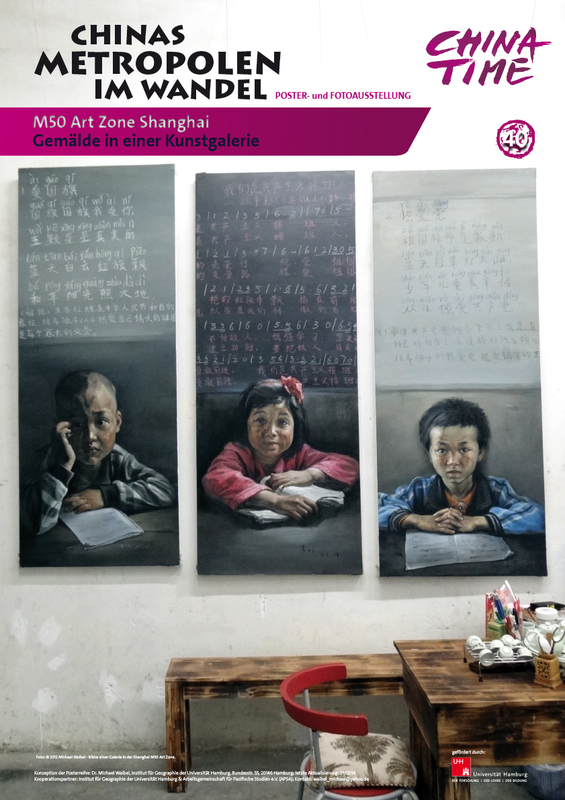 02/2009: Conceptualiziation and Update of the Poster Exhibition “Chinas Metropolen im Wandel” (20 slides), on behalf of the NGO EU-China Civil Society Forum, located at Asia House Cologne. 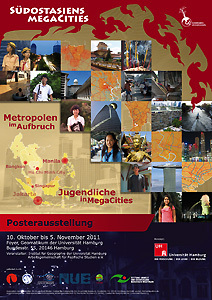 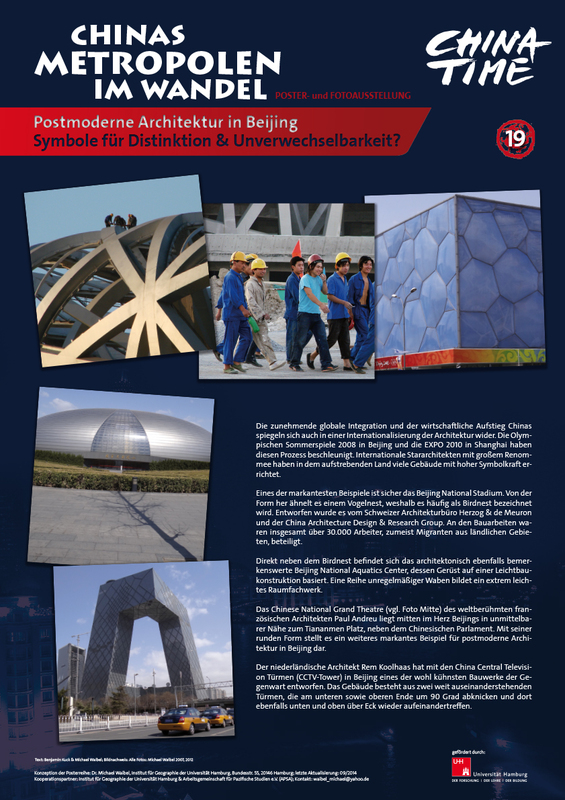 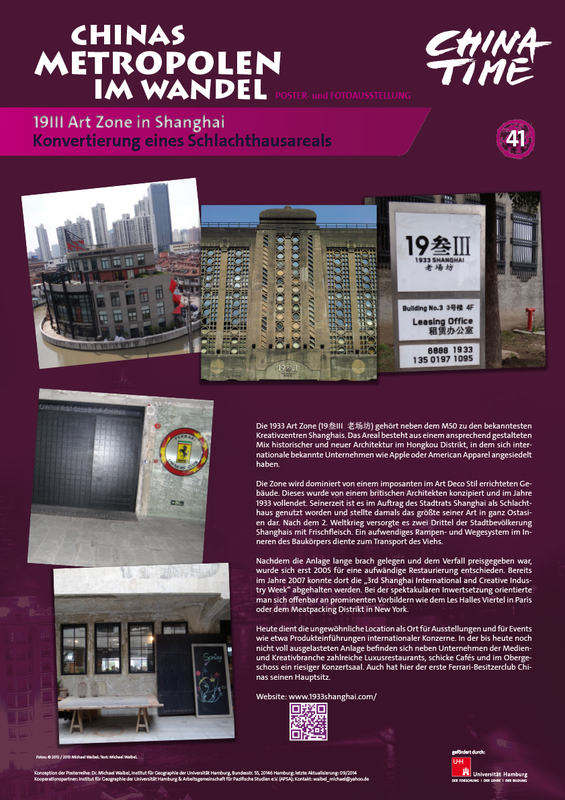 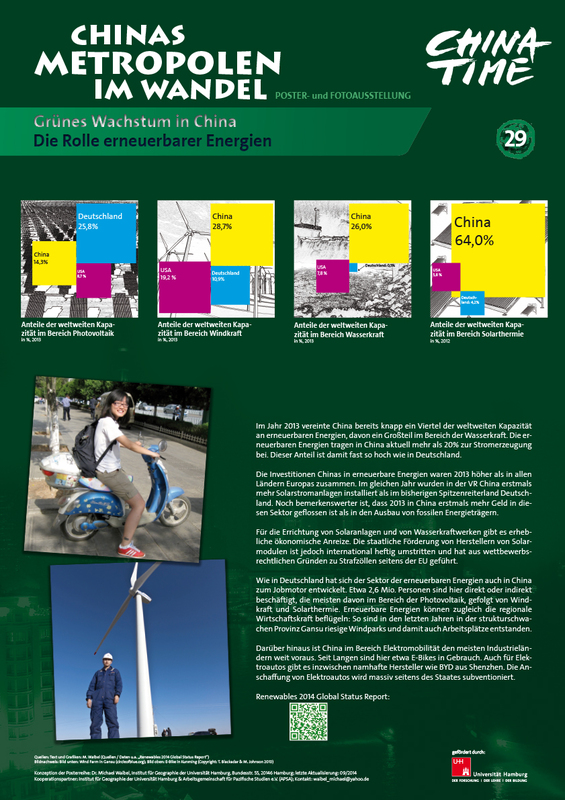 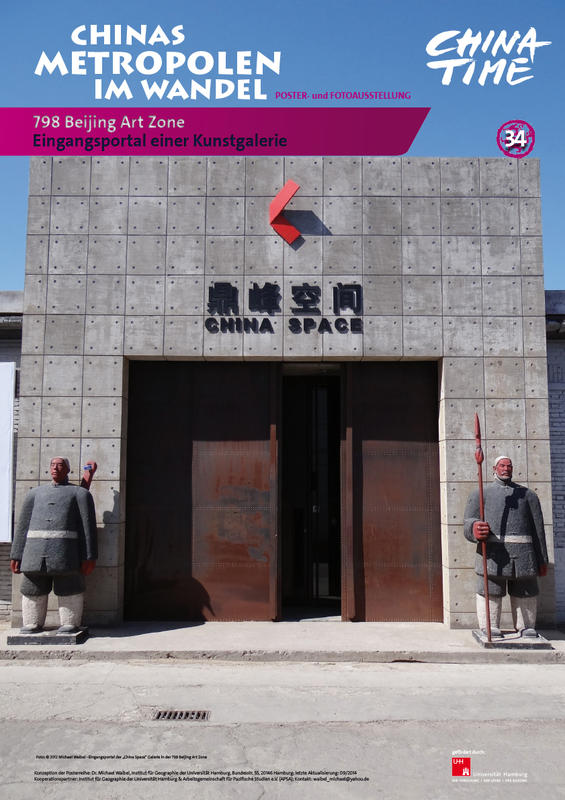 09/2008: Organizer of the Poster Exhibition “China’s Metropolis in Transition”, 12 September – 24 October 2008, as part of the CHINATIME Hamburg 2008 event series, coordinated by the Senate of Hamburg Municipality. 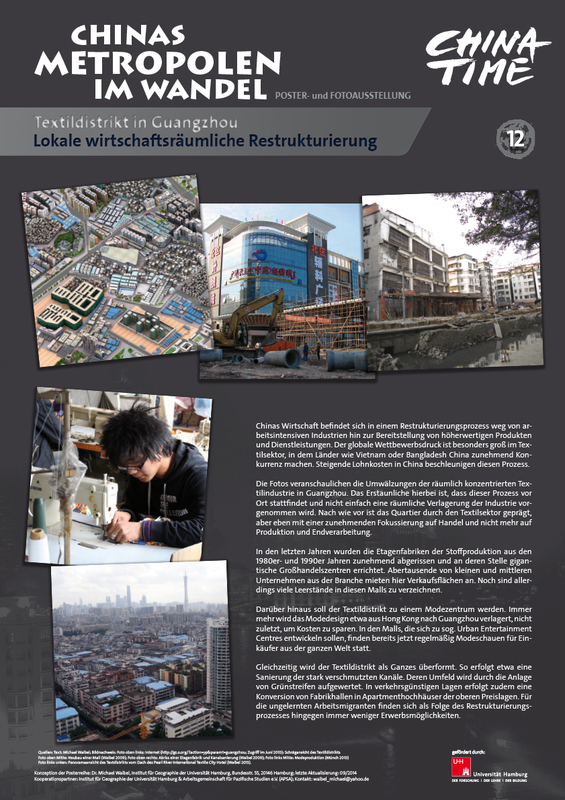 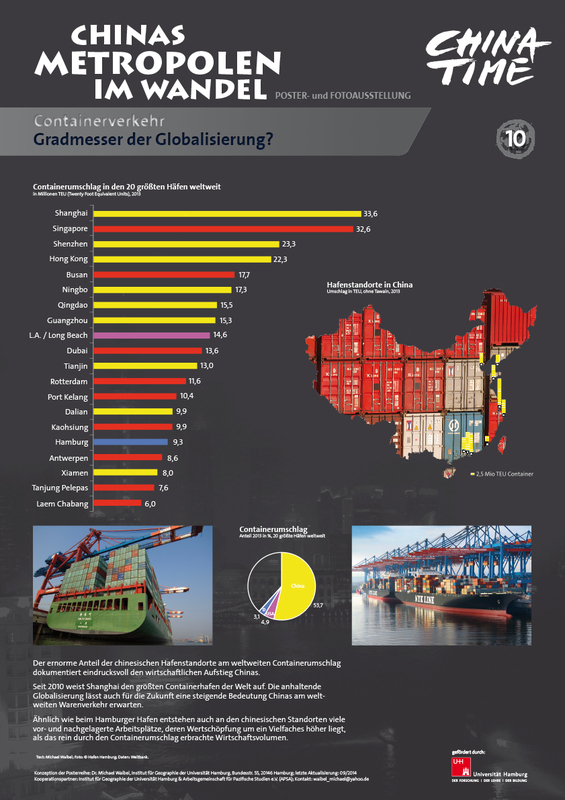 Supported by the Hamburg Innovation GmbH (HI)/Office of Information and Technology Transfer, the Department of Geography at Hamburg University and the Association for Pacific Studies (APSA). 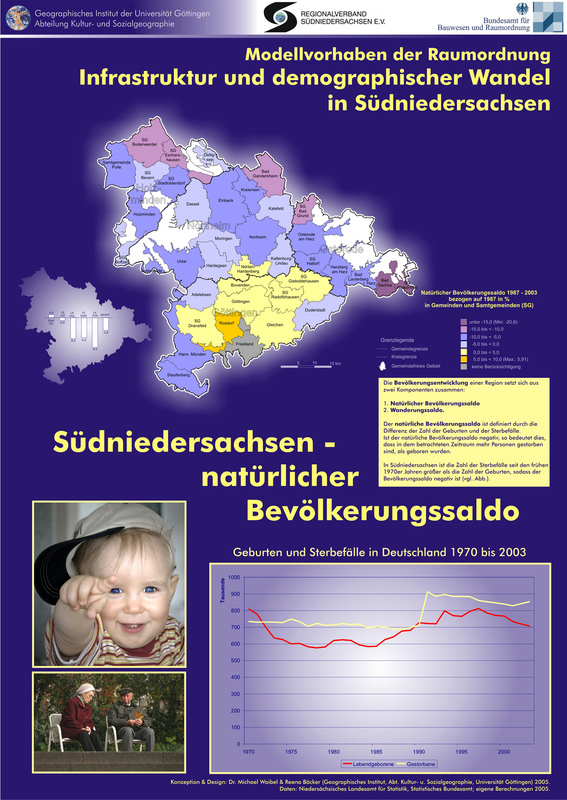 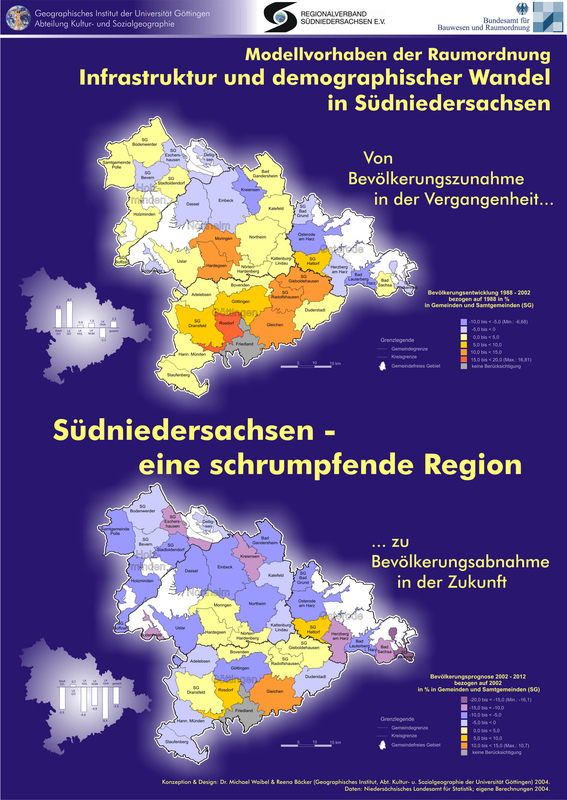 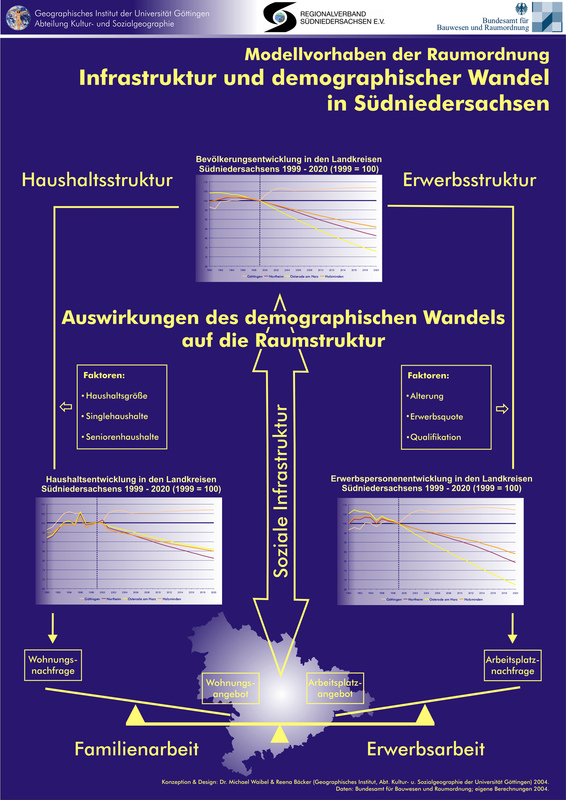 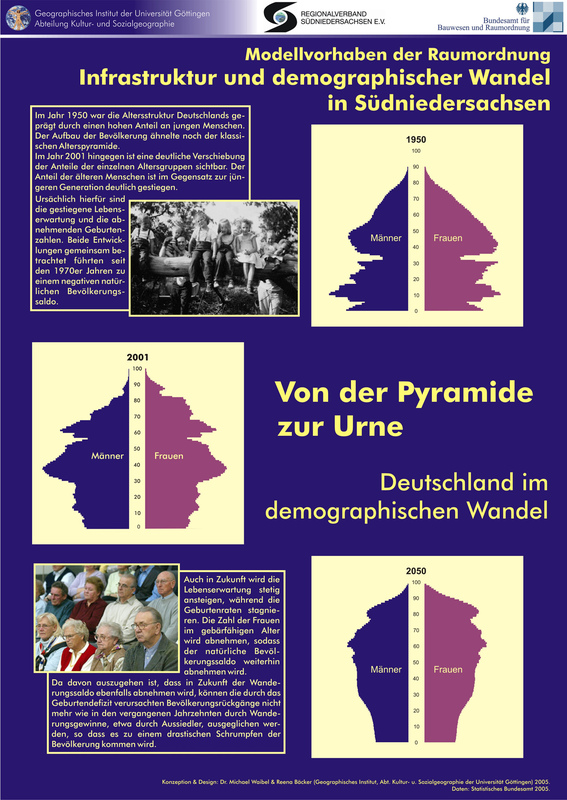 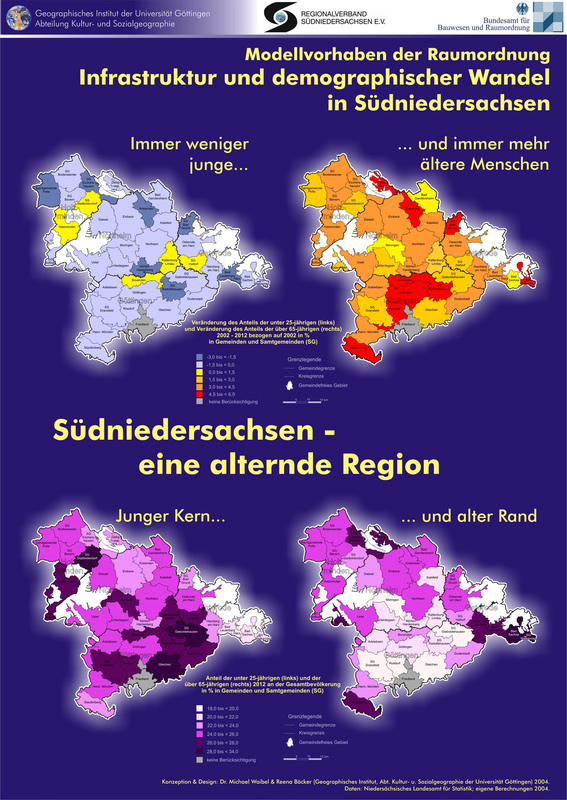 2005: Conceptualiziation of the poster exhibition “Demographic Change in Southern Lower Saxony”. 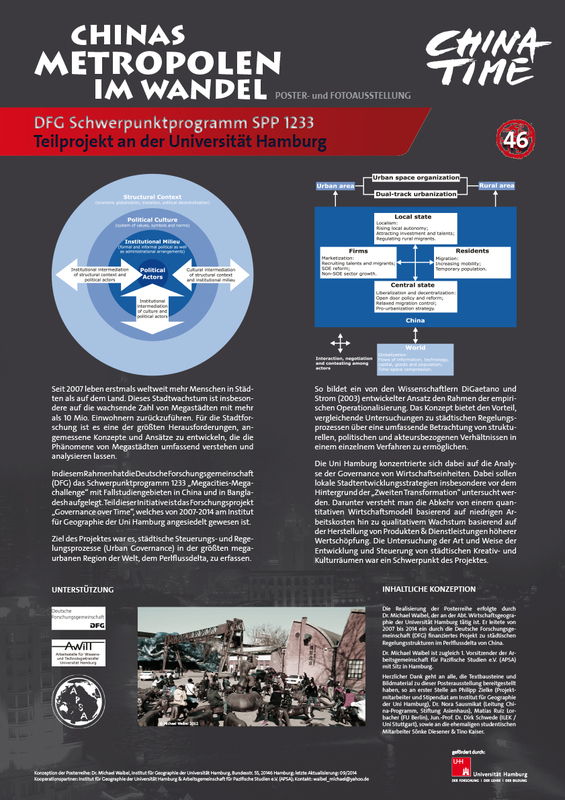 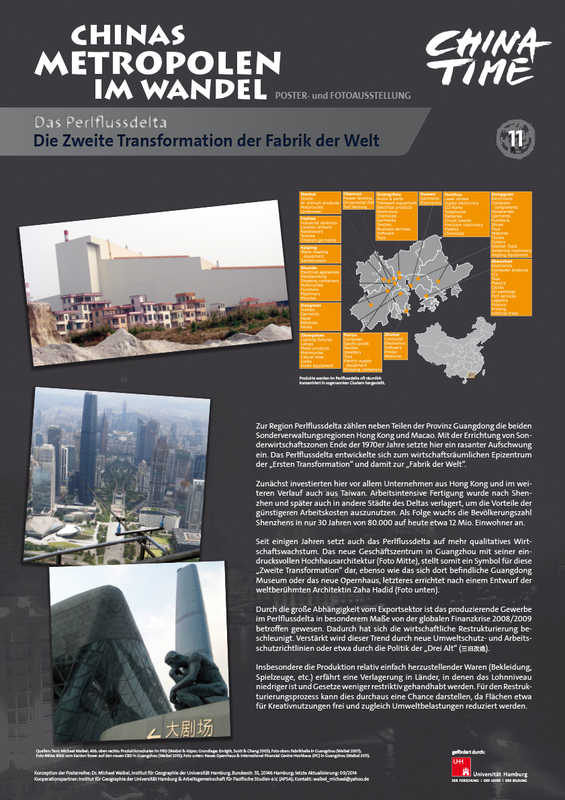 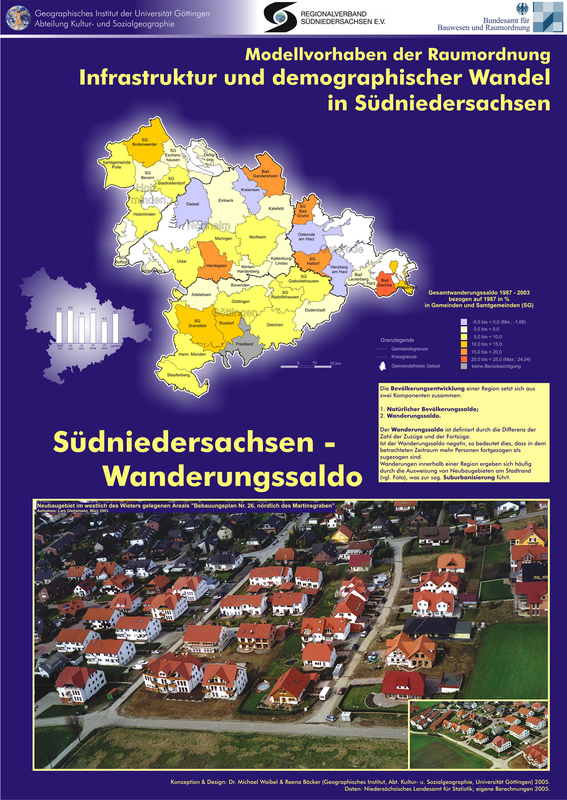 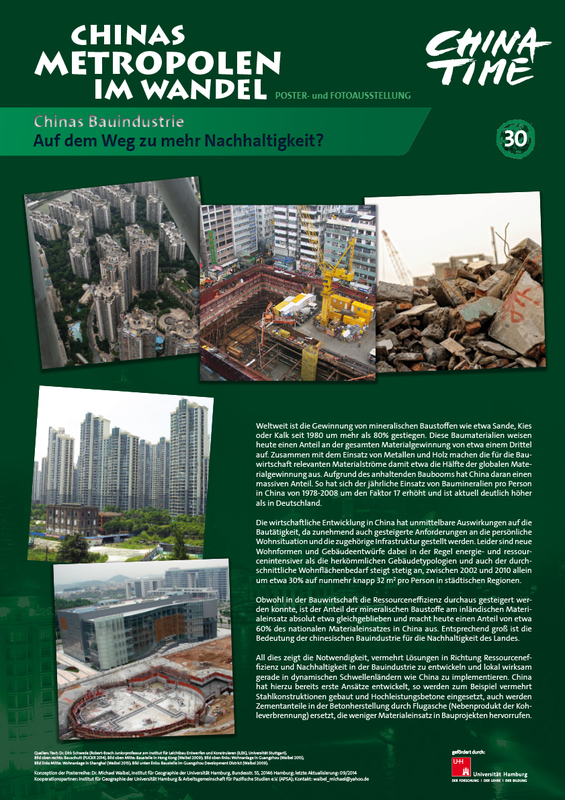 This poster exhibition was developed on behalf of the Regional Federation of Southern Lower Saxony (Regionalverband Südniedersachsen) as part of the Action Programme “Demonstration Project on Spatial Planning” (MORO). 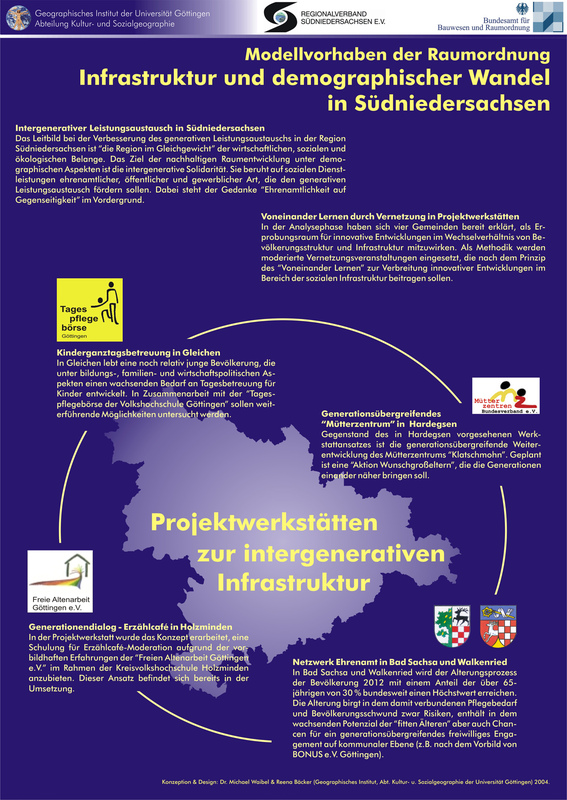 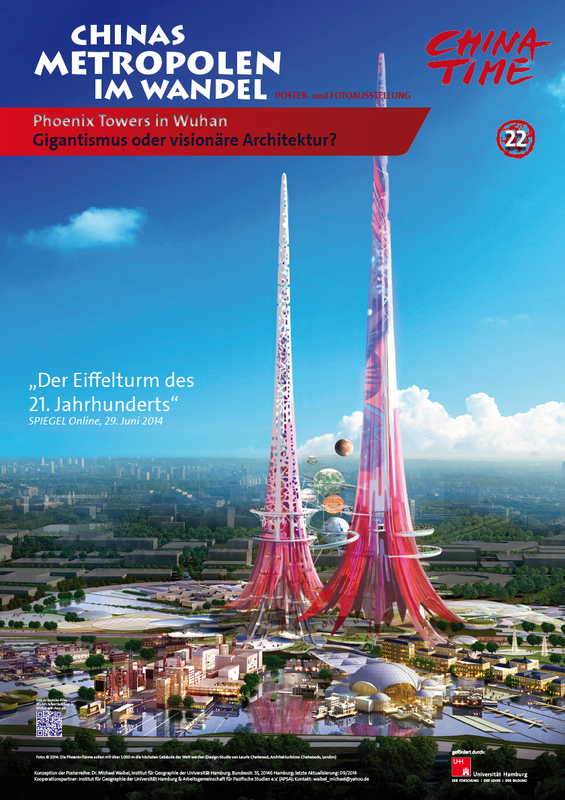 Topic: “Infrastructure and Demographic Change – Network of Generations for Southern Lower Saxony” (Modellvorhaben der Raumordnung [MoRo] mit dem Thema “Südniedersachsen 2020: Region als Generationen-Netzwerk”). 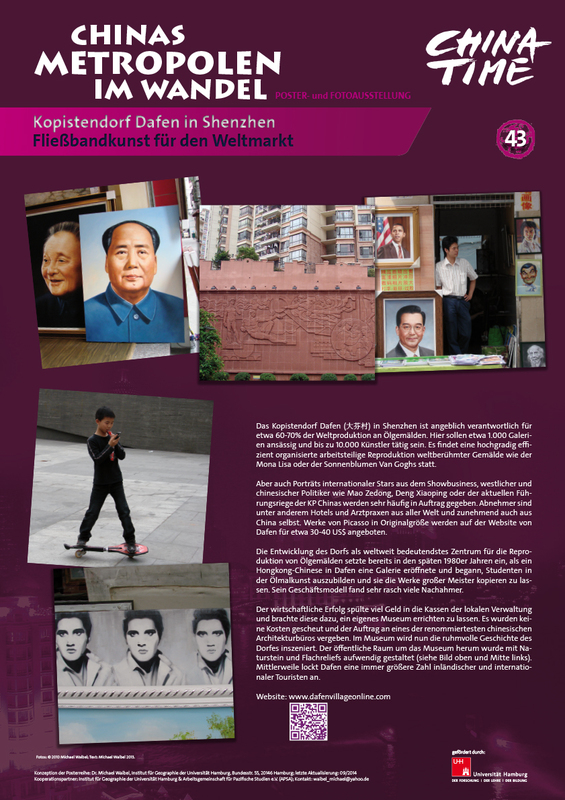 As for the layout work, I was much supported by the student assistant Reena Bäcker. 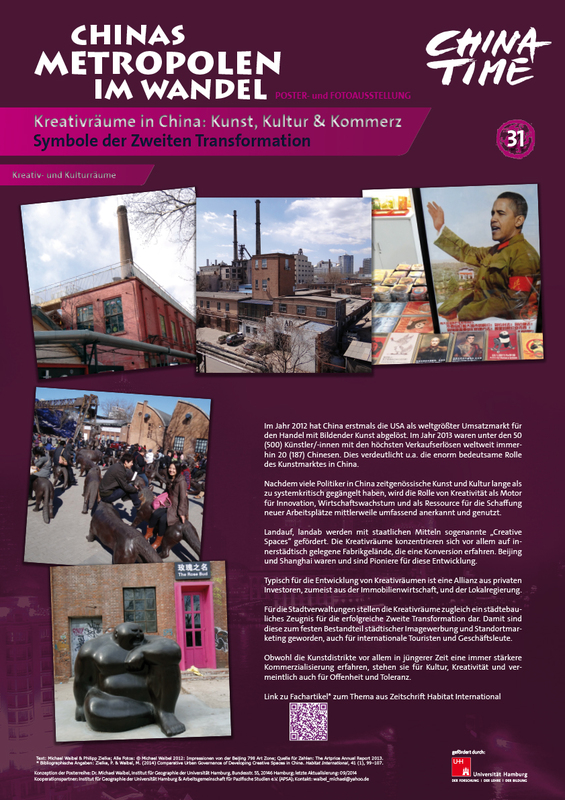 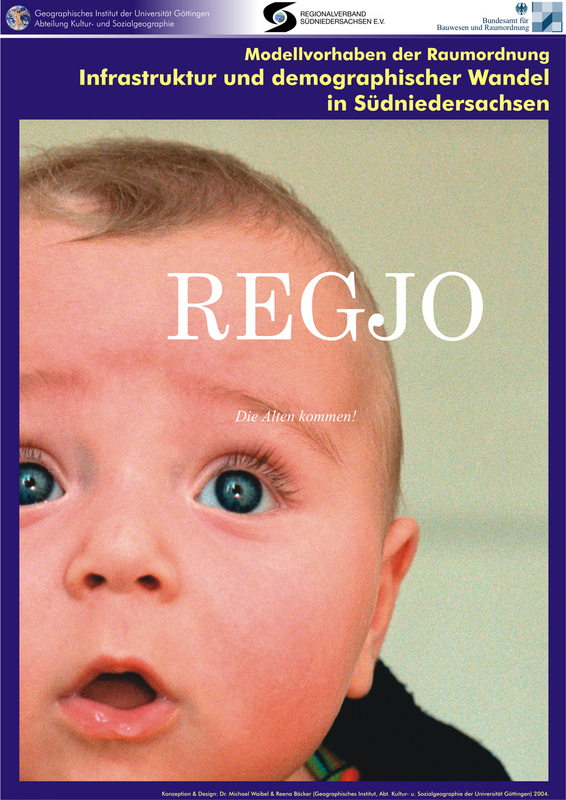 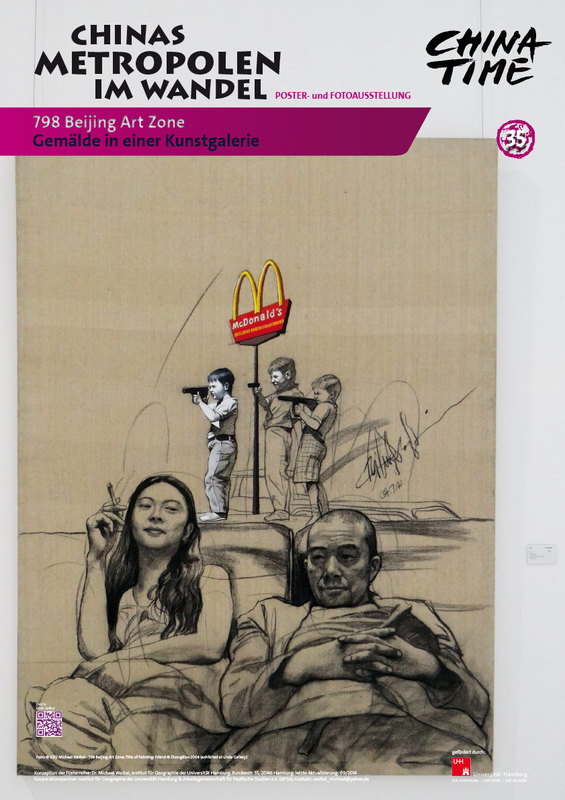 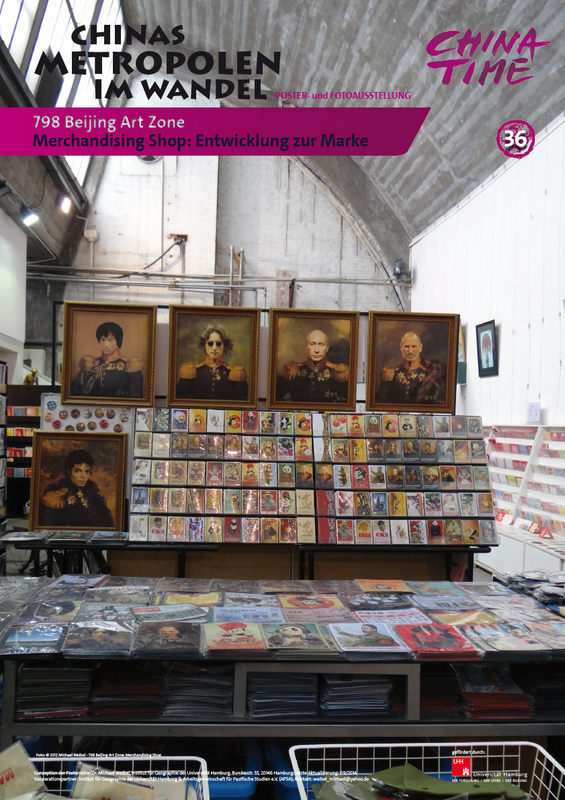 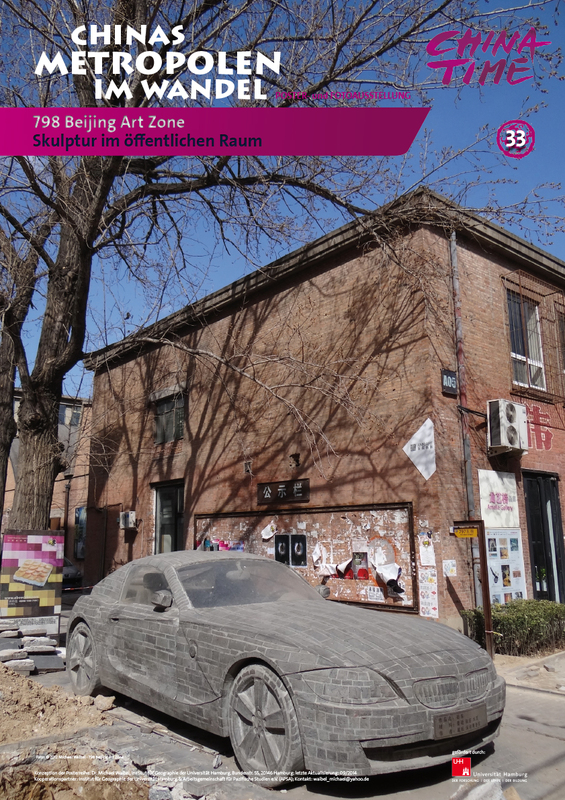 The exhibition was shown in 2005 & 2006 in various communes of Southern Lower Saxony – among others in Adelebsen, Einbeck, Göttingen (twice), Katlenburg, Northeim and in Osterode. 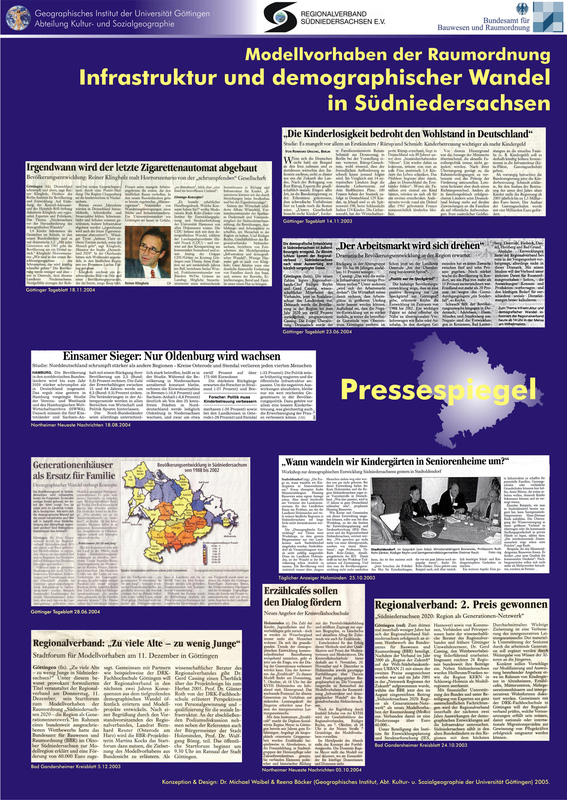 See also Press Clippings (years 2005 & 2006). 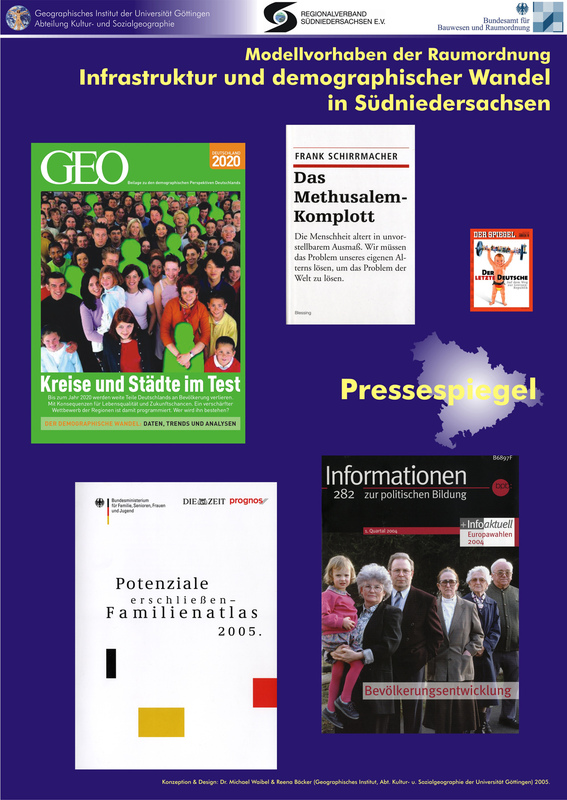 Supported by the University of Goettingen/Germany and the Association for Pacific Studies (APSA).